Dibels testing for initial consonant sound recognition in Sept then Super Phonics initial consonant sound recognition in March. The students were using Super Phonics once per week for 30 minutes during the Sept to March time frame. These students were weak with their initial sounds and the Super Phonics helped them tremendously. Super Phonics was the only program that was used in the development of initial sound recognition. The children received no other instruction for initial sound recognition. 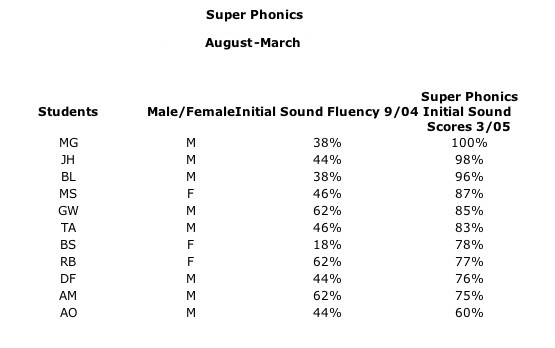 The results are even more impressive given that the Super Phonics inital consonant sound scores are averaged from the beginning so that even the weakest scores from Sept. are included in the averages.